A group of Queens condominium owners says a cluster of apartments converted into unlawful storage units has turned their building into a fire trap. For more than a decade, five first floor apartments in the Shore Towers condo building in Astoria have been used -- contrary to building and fire code -- to house 150 storage cages. Ian Snow, who owns an apartment across the hall, told the I-Team the unlawful storage units are putting him and his neighbors in danger. "To fool around and negate basic fire code is simply wrong," Snow said. Watch a half-hour special on some of the top I-Team investigations so far this year, reports that have blown open local corruption probes, exposed infrastructure problems and generated real results. If you miss it, check back later to view the entire segment online. City building inspectors have issued at least 11 violations related to the improper use of the apartments going back to 2007 and just last month, the FDNY issued a criminal summons to the building for failure to install sprinklers in the storage units. But so far the fines and penalties issued by city inspectors have not persuaded the owner to stop renting the storage cages out. "They’ve been here many times. They look around. They just issue minor violations," said Ovi Lazar, another condo owner frustrated by the unlawful storage units. Andrew Rudansky, a spokesman for the New York City Department of Buildings, said his agency has repeatedly tried to hold the owner of the unlawful storage cages accountable. "This space is supposed to be used for apartments, not storage, so we issued multiple violations and may take additional enforcement actions," Rudansky said in a statement to the I-Team. But the DOB has stopped short of ordering the storage units be vacated, because inspectors do not consider the units to be a fire hazard. Glenn Corbett, a fire science expert who teaches at John Jay College of Criminal Justice said he believes the storage cages do pose a fire risk. "This is a distinct fire hazard," Corbett said. "I’ve been in hundreds of self-storage facilities in my career, big and small. You’d be shocked to know what people store in these places." Video and images recorded by worried neighbors show the storage cages are sometimes covered with plastic tarps so it’s hard to know what’s inside. In one image, someone appears to be storing a propane tank in a storage cage. Peter Voutsas, who owns the five condo units, told the I-Team he has always worked with the city to address concerns from fire and building inspectors. "Every single time a violation was issued, every single time there was a court appearance, I had an expediter and a lawyer present and I worked with the Buildings Department," Voutsas said. "Every time they say we haven’t seen any fire hazard and worked with me." He said he is in the process of installing smoke detectors in the condos and he has an employee who consistently checks to make sure no one is storing flammable material. The five apartments are currently zoned for use as medical offices, and Voutsas says he has long sought to convert them to residential use so that he can sell them on the real estate market. But Voutsas said he has been effectively blocked from getting out of the storage business because the DOB won't approve a change of occupancy until Shore Towers clears other building violations. Until that happens, he said he will continue to rent the space out as storage -- and pay fines for the unlawful use. 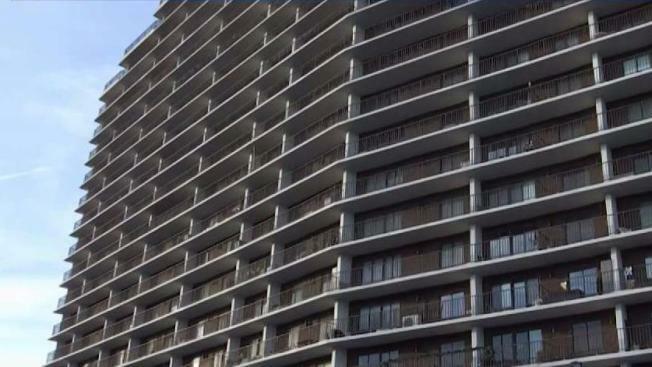 Chona Raskin, who is president of the Shore Towers Condo board, told the I-Team the vast majority of residents in her building have enjoyed having the option of renting extra storage space, and she does not consider the storage space to have ever been a true fire hazard. "The fire department just came today. They did not issue a violation," Raskin said. "They found nothing." But Raskin pledged the 150 storage cages would be gone within six months. She confirmed the building is close to clearing its DOB violations so the owner can obtain a change of occupancy permit and get out of the storage business. "I am the president of the Board and I am telling you that it will be converted and it will be residential," Raskin said.